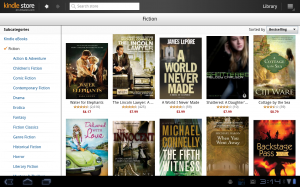 Bringing Windows 8 into the Kindle App family didn’t take long. 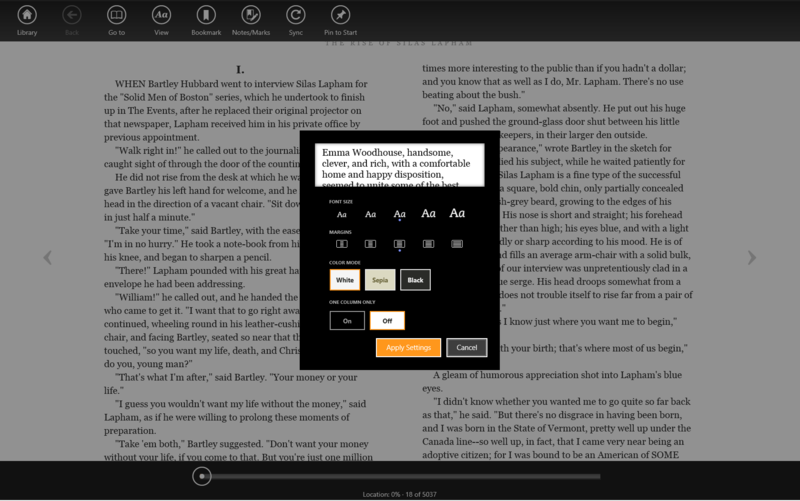 Amazon has already got a polished version of the reading software in the Windows Store and ready to use. As always, it’s free of charge. Those familiar with the workings of Kindle apps, including the Kindle Cloud Reader, will find themselves right at home here. There are, however, some peculiarities that make the Windows 8 offering stand out. All of the standard features are present here. The app can open any document associated with your Amazon account in either Cloud view or locally once you’ve downloaded it. Whispersync takes care of updating your notes and maintaining your position in the document. There are a number of options to customize parts of the display including the margins, font size, and color scheme. A selection of fonts would have been nice, but that’s my only major complaint. Basically you can assume that this app is a portal for the Kindle Cloud Reader without being too far off. The visual style of the library is more in line with the Windows 8 aesthetic and some of the capabilities the app offers are specific to Windows 8, but once you are reading a book all of that falls away and it’s the same familiar experience. The Windows 8-specific features are worth bring aware of, though. Amazon has done a good job of integrating the hooks that make Microsoft’s new interface distinct. The Charm Bar, largely the way you handle searching, sharing, and settings in any Windows 8 app, is the first thing to be aware of. Searching the Kindle App will first pull up your library, making it handy for anybody with a large selection on hand, but will also show the top twenty search results from the Kindle Store. Clicking on any of these will open a browser for shopping. This searching is available even if the app itself isn’t currently open thanks to the way the Charm Bar works, taking a step out of the process of opening or shopping for a book. Since Charms are the way that all sharing is handled, this is also where you go for that. My first attempt allowed me to share the title of the book I was reading, a note to go with that title, and a link to the book in the store. This function will probably get more robust once Amazon figures out how to handle the even-handed treatment of all social sharing options in Windows 8. It is also possible, and quite obvious, to “pin” a title to your Start Screen. Any time you select a book or open the app bar while reading, this option is presented. What this means is that the book will show up as a tile in the Start Screen, allowing you to jump directly into your book without worrying about navigating the library. It’s a handy way to keep your current books readily at hand. Basically, while the Kindle for Windows 8 app doesn’t accomplish anything revolutionary it also doesn’t have any obvious problems. For a launch app, you’re not going to find many better implementations. Check out win8review.com for more information. As many of you may be aware, the deadline for app developers to comply with Apple’s new competition stifling rules is the end of this month. So far, no changes are evident in either the Amazon Kindle for iOS app or even the Barnes & Noble Nook app. While it would seem odd for this to be the case this close to the deadline, I’m thinking it might be a carefully made decision on Amazon’s part. We know by now, or at least are overwhelmingly confident, that there will be a Kindle Tablet coming later this year. By releasing something like that, Amazon sets themselves up for a far more justified version of the old Kindle vs iPad debate. They need to set themselves apart as a device company. The way I see it, Android isn’t enough at this point. Too many other people are already working with it. Even having their own on-site app store won’t necessarily wow anybody. Some good publicity would help though. Assume for a moment that the Kindle for iOS app doesn’t get changed in any way before the June 30th deadline. Apple will then have two choices. They can either follow through on threats to remove apps in violation of the new rules or they can publicly admit that they need what these developers bring to the table. I think it’s likely that banning will occur. Amazon’s response to this, if planned correctly, could be huge publicity. I would expect something along the lines of a public statement explaining that the Kindle Store simply cannot productively operate under the restrictions that Apple is trying to place on it, but that as a service to their loyal customers the app will be chopped down to comply with the new rules enough so that existing customers can still read what they’ve bought while Amazon examines other solutions. Then, a month or two down the line, a full roll-out of Kindle for the Web that completely bypasses the need for apps. Yes, under the new rules Amazon could just raise prices of in-app purchases to make up the margin that Apple is demanding. This would bring them nothing but ill will from the average Kindle for iOS user, though. With the new line of Kindle Tablets pending, these are the same customers that Amazon has to be hoping to win away. Probably not the smartest thing to pass on fees to them. They could also choose to simply announce that all purchases must be done on the website and do away with the in-app purchasing links. I think that’s probably what will happen with the post-banning reboot of the app, should my scenario prove true, but it would cause the loss of impulse buying opportunity for a large portion of the Kindle user base without also providing any sort of good PR. I just don’t see that making sense right now. We’ll know by the end of the month, of course, but right now there hasn’t been any intention to comply expressed by Amazon. Most likely, they’ll just stand by and watch Apple shoot themselves in the foot while pointing out that the Kindle makes a great, affordable eReader alternative to putting up with that sort of ridiculousness. The Kindle for iOS app doesn’t seem likely to be as profitable for the company under the new guidelines anyway, so they might as well get that preemptive jump on Apple in the public eye. One of the major selling points of the Kindle product line has always been the ability to read your books on pretty much anything with a screen you might happen to be sitting next to. When you go with Amazon’s eBooks, what you’re doing is effectively eliminating platform distinctions, at least in theory. Of course, the recent release of Google’s entirely platform-agnostic eBook store shook things up more than a bit! Still, what gaps there are in the Kindle coverage are being filled in enthusiastically. 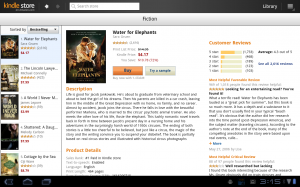 It would not have been entirely surprising if, after the recent unveiling of the upcoming Kindle for the Web service, we had seen a drop in attention given to platform specific software options. After all, if the idea is to be accessible anywhere, a browser-based option has you pretty much covered, right? Apparently that’s not going to be quite the direction things are taken. The recently announced Kindle app for Windows Phone 7 isn’t likely to surprise anybody with its feature set at this point (it is just the latest incarnation of a chain of six or seven other apps depending on how you count it), but it does manage to accommodate the potential needs of a quickly growing segment of the smart-phone marketplace. As expected, you will have adjustable font sizing, background coloration, integrated eBook store access, social networking possibilities, and the ever useful WhisperSync keeping track of where you left off. While the jury is still out as to the future of the new OS in light of its more established competition (let’s face it, you can’t really consider Windows Mobile to have been a particularly valid entry into the consumer marketplace), the potential for its inclusion in the increasingly popular tablet PC marketplace alongside Apple’s iOS and Google’s Android makes this an incredibly lucrative market for Amazon to tap, at least in theory. With this addition to the Kindle‘s software line, they’re drawing pretty near to having an entry into every portion of the active cellular marketplace. The only really significant point to jump in would seem, from what I know, to be with Nokia’s Symbian OS. While I’m admittedly not the one to talk to about the potential technical complications of putting out something for that operating system, the demand seems to be there if the ongoing petition is anything to go by. There’s not much more to be said about this one. As always, I can’t say that I would find myself happy with using a phone or tablet pc as my primary reading device at any point (empirical evidence supporting the eye strain complaint as it does for me), but as a supplement to my Kindle itself, these apps have frequently come in handy. Sometimes you don’t feel like carrying around that extra device that just won’t quite fit in your pocket, but who doesn’t have their phone with them at any given time? It’s a convenience, and one I’m particularly glad I don’t have to do without.